Monday April 17th 1899 I was busy about the work all the forenoon and looking after the chickens. I did a little sewing in the afternoon and went up to see how Mrs Bell was. The boys began to sow oats on the Bird land and Will is burning stalks. Tuesday April 18th 1899 It rained last night and I had Luther to churn for me and help wash. I went down to Callies after my dinner work was done. I sewed some and put a row on the mat in the evening. Wednesday April 19th 1899 I ironed and got the dinner. It was such a pleasant day. Will hitched Nell for me in the afternoon. I went up to Stevens and staid all the afternoon. Did the regular evening work. 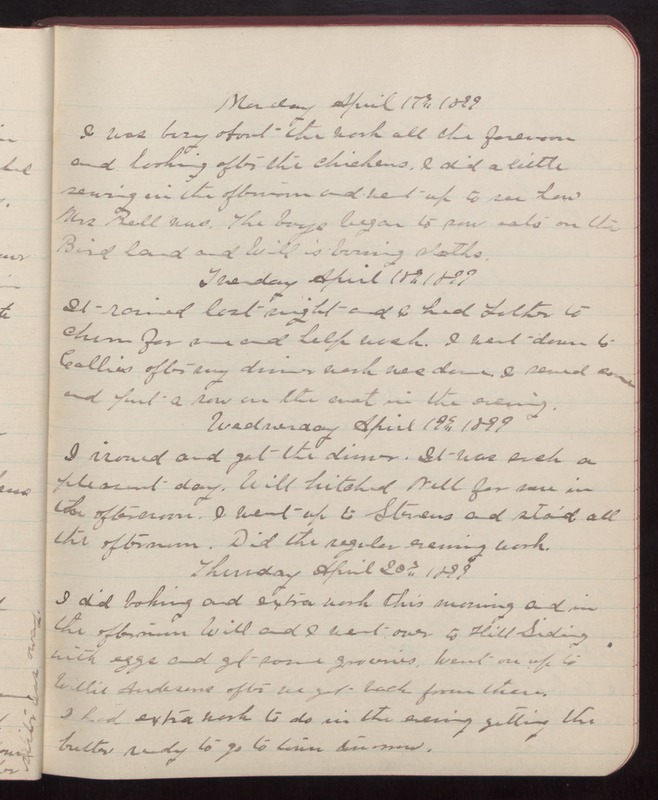 Thursday April 20th 1899 I did baking and extra work this morning and in the afternoon Will and I went over to Hill Siding with eggs and got some groceries. Went on up to Willie Andersons after we got back from there. I had extra work to do in the evening getting the butter ready to go to town tomorrow.